Google Maps is improving offline functionality by bringing it much closer to Maps' connected mode. Google is making life easier for anyone who needs to use Maps in areas with spotty data connections. On Tuesday, the company added new functionality to offline maps including turn-by-turn directions, the ability to search for a destination, and place data. To use the new offline features, you first have to manually download a specific section of the map. Google’s new offline functionality is rolling out right now to Android and is coming soon to iOS. Google first announced the new offline features in May during Google I/O. Google Maps has a vastly improved offline mode. There are two ways to use the new feature to save map data for either a city, county, or country to your device. First, you can just search for the area, tap the banner at the bottom of the screen to bring up the place panel. Then just hit the download icon, confirm you want to download, name the offline area, and you’ll have offline access to that area of Google Maps. The second way to add an offline area is to tap the “hamburger” menu on the left side of the screen, select Offline Areas, and tap on the + button. After you download specific areas, Google Maps will move into offline mode automatically when you hit a patch with spotty service—or none at all. Once the connectivity gets better, Maps will flip back to online mode. Although offline Google Maps now offers deep functionality, the one major thing you won’t be able to do is see live traffic updates. We haven’t had a chance to try out the new feature yet so we can’t comment on how much storage a map area will take up. Google says that by default it will only download Map data when on a Wi-Fi connection. The impact on you at home: Google Maps has had basic offline functionality for nearly five years. The original feature automatically cached areas of Google Maps that you frequently visited. 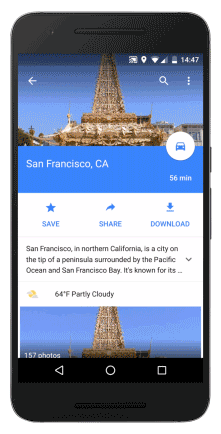 All you could do, however, was use Google Maps as a digital stand-in for its paper counterpart—voice-guided directions and other features were not available. This latest upgrade brings offline Google Maps almost as close as possible to the connected version. One notable missing piece is the ability to view public transit information something Google said in May that it wanted to bring to Maps in offline mode.